SYRIA, in the Middle East, is an independent state from 1946. It stretches on 185,000km and has a population of about 19 million. About 75% are Sunnite Muslims, 11% Alawites, 8.5% Christians and the rest are from other sects. 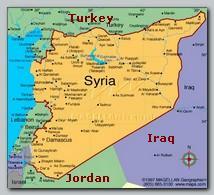 After World War I SYRIA came under French mandate. In 1920 the French managed to suppress a SYRIAn Arab rebellion. In order to find local long lasting support in the Middle East they tore Lebanon from its traditional homeland – SYRIA and created the artificial Christian state – Lebanon. Today (06/2007) SYRIA still refers to Lebanon as its domain, refuses to exchange official diplomatic relations with Lebanon and keeps a symbolic empty chair in the SYRIAn parliament for the Lebanese delegate. From 03/1973 SYRIA is ruled by an autocracy of Hafez al-Assad and his successor Bashar al-Assad, socialist secular Baath party and the SYRIAn Army. The al-Assad family is Alawite and in order to strengthen their grip on power, as it is so common in the Middle East, all the key functions in the political party, the army and security services are in the hands of Alawites. The Alawites keep to a particular interpretation of Islamic Shiia. Many Sunnite scholars refer to the Alawites as an inferior agnostic sect. As a result a Sunnite violent Islamic underground, based on the Muslims Brotherhood, carried out intensive bloody terror attacks all over SYRIA in the late 70s’ and the early 80s’. In order to put an end to Islamic terror in SYRIA – SYRIAn Special Forces surrounded in 03/1982 and attacked all places that sympathized with the Muslims brotherhood. In Hama, the strongest stronghold of Muslims Brotherhood, the SYRIAn Army leveled large part of the city and butchered 12,000 to 20,000 people. It is unknown how many were militants and how many innocent civilians. That Hama Massacre in 03/1982 put an end to any Islamic terror activity in SYRIA for more than 20 years. Islamic militants who managed to flee SYRIA to Europe participated later, often, in Islamic terror cells in Europe. When the war in Iraq began in 2003 an unnatural alliance merged between SYRIA and Islamic Militants. SYRIA, allied to Iran and an adversary to USA, wanted to support Iraq insurgency against USA and Islamic Mujahidin from all over the world streamed to Iraq for the same purpose – to fight the Americans. For the time being (06/2007) an alliance of interests takes place between the Baath, Socialist, secular regime of Bashar al-Assad in SYRIA- a regime that butchered brutally so many Muslim brotherhood members, and the historical rival of the Alawite Baath – the Sunnite Islamic militants. This alliance formed in order to serve a common goal – to defeat USA in Iraq and elsewhere in the Middle East. SYRIA is today (06/2007) one of the main supporters of the Islamic Global Jihad.